Former military pilot François Moné has taken on the traditional role of Chief. He explains how he is using this to pursue the development of the village. ‘Bonjour, Monsieur François,’ I respond, naturally enough. The mouths of the men sitting on the mat around me drop open in shock. I have, it seems, committed a grave faux pas: no-one is allowed to address the Chief by name, only by his title. This is a touch embarrassing but somewhat understandable given that I knew the Chief as plain François Moné 21 years ago. He later tells me that technically I should offer him a chicken in propitiation for this transgression, but that he will graciously exempt me on this occasion. It is strange to see him in this traditional role, in which people routinely bow and scrape before him when he receives them under the awning beside his house. When I heard in advance of my trip that François had become the traditional Chief, in one respect it made perfect sense. He has always been talked about by villagers in tones of awe on account of what he has achieved in the wider world. Yet in another respect the idea seemed absurd. François is a thoroughly modern man, urbane and well educated: how on earth could he fulfil that role as guardian of the village’s ancient animist traditions? As a child, François was one of the very few villagers who received an education – though he had to walk the four kilometres to Garango to attend the French colonial school. Independence came while he was still at school and after he had passed his baccalauréat he joined the air force in 1974, at the age of 21, and trained as a pilot. This involved spending two years training in France, which he liked at first; but after a year or so he started pining for home. He travelled all over north and west Africa, but also spent time in Cheshire, England, while Burkinabè planes were being refitted by Hawker Siddeley and speaks some English as a result. He knew Thomas Sankara well – and on the day of the Revolution in 1983 was sent by him to Accra to collect a load of Kalashnikovs and other weapons that had come from Libya. 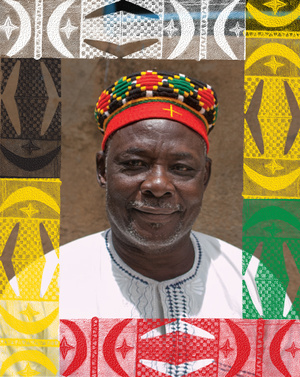 He has always lived with his own family in the capital, Ouagadougou, but has made a point of keeping in close touch with people in the village and making regular visits to what he has always considered to be his ancestral home. Though the role of the traditional Chief was sidelined and scorned by Sankara’s revolution, I have always had to visit the Chief to pay my respects. What I had never realized until this latest trip, however, was that the old, blind Chief was a Mossi man imposed on the village by the regional authorities, rather than a representative from the local Bissa people. This originally happened, François says, because previous Bissa chiefs had been ‘naughty’. But the net effect was that the Mossi chief was never taken that seriously and never participated in any of the traditional animist rituals. In 2012, however, the elders of the village decided that they had had enough of being dictated to by the regional authorities and that they wanted a Bissa chief, someone from the village who spoke their language and understood their traditions. And what did you initially think of the notion? I imagine you wondered how you could act as guardian of the traditions while living a modern, urbanized life in Ouagadougou. But I presume you accepted the role of Chief not to continue the old traditions but to develop the village and the life of its people. ‘Exactly. That’s what I was coming to. 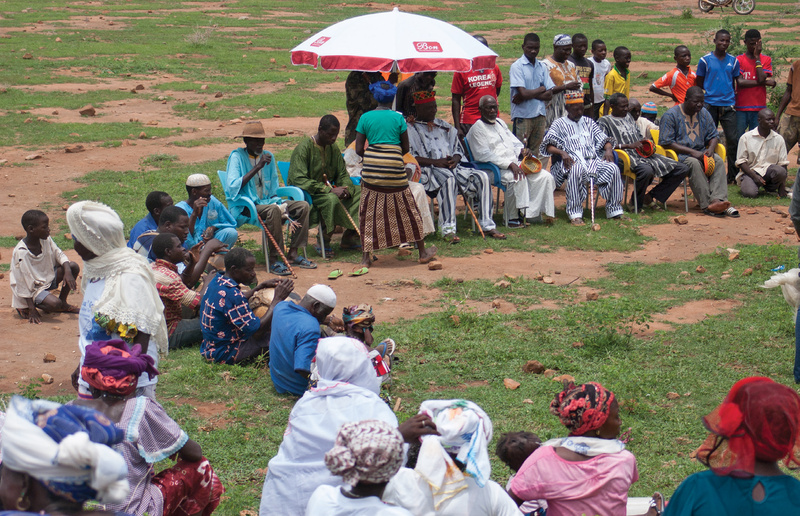 We have formed the Association de Resortissants de Sabtenga at Ouagadougou, though also in Italy, Côte d’Ivoire, Gabon, France, the US – wherever there is someone from Sabtenga who is concerned about the economic and cultural development of the village. It was this Association that told me to accept the offer to become Chief, because they thought it could help them to have an impact. So I assumed the role of interface between the village and the Association. Yet to play this key role in the development of the community, the Chief also has to participate in traditional ceremonies at certain points in the year. The main animist rite of the year takes place while I am in the village and involves scores of people gathering in their finery at the foot of one of the stony hills that adjoin the village, which look a little like the kopjes of southern Africa. They have come together to propitiate the local gods by asking them for good fortune, which involves the ritual sacrifice of hundreds of chickens and a few poor goats. Others, who cannot stretch to an animal, bring cooked food or even tree branches. In a village where animism, which was so powerful when I was first here, has seemed increasingly sidelined by Islam, Christianity and modernization, this is a strange sight indeed – and one that evidently fascinates many teenagers from Muslim families whom I know have been forbidden to attend by their parents but watch from the hillside regardless. The contradictions are obvious – and the Chief’s Catholic faith as much as his modernity makes his position a peculiar one. But, though it is certainly not the kind of revolution that Thomas Sankara had in mind, in its own way the village has exercised people power by defying the authorities and going out on a limb to insist on having one of their own as Chief – and by embracing modernization and social progress in doing so. Also available: the full, wide-ranging question-and-answer interview with the Chief.